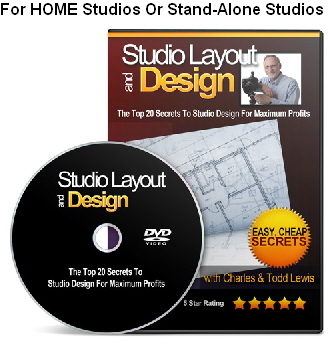 SECRETS TO STUDIO LAYOUT AND DESIGN REVEALED! What If You Could Make A Few SIMPLE, FAST, And CHEAP (yes, I like that one best) Changes To The LAYOUT Of Your Studio, And Bring In An Average Of $1000 More PER SESSION Because Of Them? The key to successful studio layout and design: COPY THE SECRETS OF AN ULTRA -SUCCESSFUL PHOTOGRAPHER'S STUDIO, but do it without having to rebuild, redesign, and completely change what you already have! Don't kid yourself - the layout and design of your studio space is one of the most important single factors that determines your PROFITS from your clients. NO KIDDING! I'm not exaggerating here. It doesn't seem possible, but I have proven it to be true, not only in my own studio over the years, but also in studios of photographers all over the country who have hired me to come to them to OVERHAUL their studio design. MAJOR STUDIO LAYOUT SECRET #1 - The Best Way To Layout Your Studio Is NOT Like A Gallery! In this part of the video, I'll reveal exactly what your studio should look like, and believe me, it goes against what we THINK is right... YEARS of trial and error have shown me the single best layout system! MAJOR STUDIO LAYOUT SECRET #2 - How To DISPLAY You Images Throughout Your Studio! 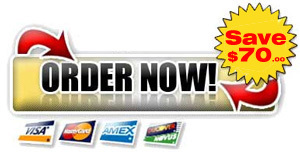 MAJOR STUDIO LAYOUT SECRET #3 - Your SAMPLE BOOKS - The Key To Profits Is Right In Front Of You! MAJOR STUDIO LAYOUT SECRET #4 - The CLIENT AREA, This Is Where The MONEY IS MADE! Once a client walks in your door, the sales process has already begun. I've put together a great "client-area" design system on this DVD that will give you all the secrets you need in order to make sure that this area is making you all the money it can. MAJOR STUDIO LAYOUT SECRET #5 - Decor Decisions & Minor Changes! And Those Are Just 5 Of The 20 Major Secrets Revealed On This DVD (delivered digitally right to your computer)! One of the questions I get asked the most is: "What should my studio look like?" And, I also get this one: "Are there a few simple changes I can make to my studio, without having to spend a lot of money, that will translate almost instantly into higher sales?" Well, I determined it was time to answer both of these questions once and for all. So, I've put together a NEW VIDEO program (that we'll deliver right to your computer, so you don't have to wait a week to get it in the mail) where I reveal the TOP 20 SECRETS TO STUDIO LAYOUT AND DESIGN FOR MAXIMUM PROFITS! These are secrets that will work whether you work out of your home, or an actual studio! Within 30 minutes of watching this online video, you will be able to take action to make FAST changes that have the power to DRAMATICALLY increase your average sale by $1000 INSTANTLY - yes, I've seen this happen many times with photographers who hired me to implement these secrets with them. Even if you're working out of your home, and don't have an actual studio space, the areas that your clients see are VITAL to your success. HOME OR STUDIO: The key to successful layout and design - COPY THE SECRETS OF AN ULTRA-SUCCESSFUL PHOTOGRAPHER'S STUDIO, but do it without having to rebuild, redesign, and completely change what you already have! I'm NOT going to recommend in this digitally-delivered video that you tear down walls, and redesign the blueprints of your studio. No way! Who has the time or money for that? What this video is going to do is to reveal tips and secrets you can implement RIGHT NOW, so you start to see higher sales and more thrilled clients within days at the most! TO THE LEFT, YOU SEE JUST 5 OF THE 20 SECRETS REVEALED ON THIS DVD! 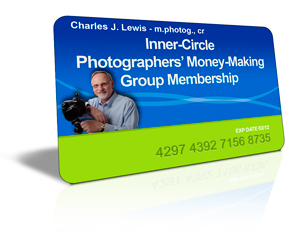 PLUS, as part of this special offer, you'll also have access to our complete PHOTOGRAPHERS' MONEY-MAKING INNER-CIRCLE membership site for FREE for 25 days as well! Then, after your free 25 days are up, if you don't decide to cancel, you'll remain a member at the low price of only $29 per month, and you'll have access to the entire site as long as you like! CLICK HERE if outside the U.S.
You get a trial membership (with FULL UNLIMITED ACCESS to the Inner-Circle Photographer's Money-Making Membership Site For 25 Days) Including the STUDIO LAYOUT & DESIGN VIDEO for only $29! Plus, starting in JUNE, if you don't cancel, you will be able to remain a member at the special continued discounted rate of only $29 per month ($34 if you're outside the U.S.) to continue your access to the site & the STUDIO DESIGN VIDEO as long as you want to stay a member. Again, you may cancel at ANY TIME. Why Am I Only Able To Make This Offer Till 2:00pm Friday Afternoon? I can only make this offer till 2:00pm Friday because at 2:30pm, we are closing the studio down for a long weekend, and no one will be back in till Tuesday of next week. And yes, despite the fact that this is a digitally-delivered product, my staff still has to process these orders personally to make sure everything is done correctly. So, no joke, at 2:00pm Friday, you will not be able to get this offer, as the office will be closed down till next week. Sorry about that, but spring is here, and we are taking some serious time to enjoy this Michigan spring weather. Access To A FULL ONLINE MEMBERSHIP SITE Jam Packed With Photography Money -Making Secrets, Including over 48 HOURS of FULL-LENGTH Videos, Tons of Audio, My Photography "TELECHARTS" For Instant Download, Photography Pricelists and Packages all Laid Out, Printed Materials, And MUCH MORE! Includes FULL-LENGTH Audio & Video Programs On Senior Marketing, Facebook Marketing, Telephone Secrets, Selling Techniques, Internet Marketing Lighting & Posing, and more... YOU GET ACCESS FOR THE REST OF MAY RIGHT NOW! And you may cancel ANY TIME. DIRECT ACCESS TO YOUR PHOTO-SUCCESS TEAM! - Every few months, we will have an INNER-CIRCLE call-in day. During these days, our Inner-Circle members have direct access to me by telephone. This is basically ONE-ON-ONE consulting, where you can ask me any questions, bring up any challenges, and I'll help you every step of the way. You'll also have 24/7 access to a special MEMBERS-ONLY email address that you can use to email me questions any time. This is UNPRECEDENTED access to me and my team! MEMBERS-ONLY Hot-Tips, Webinars, And More! You'll be part of this elite group, and as part of that, you'll have access to members-only webinars, hot-tips, email blasts, additional online audio programs, and more as they become available. ALL INCLUDED IN YOUR MEMBERSHIP. You get a trial membership with access to the complete membership site (with the STUDIO LAYOUT & DESIGN video) for only $29! Plus, starting in JUNE, you will remain a member at the special discounted rate of only $29 per month ($34 if you're outside the U.S.) for this membership as long as you want to stay a member. Again, you may cancel at ANY TIME.